Karen works for Raytheon as a sous chef. This job is one where she has the responsibility of assisting the head chef. She is responsible for cooking for about 48 people at the time I am writing this, but because different groups come and go she probably cooks for around 200 different people in a season. 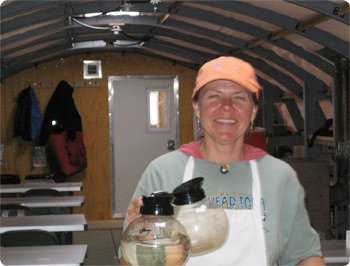 When not on the ice, she lives in Alaska and runs a hospitality business in remote sites, such as Camp Denali. She has lived lots of different places in her life, both within the United States and in other countries. Her family moved quite often so she got to experience life in Connecticut, New Hampshire, Iowa, and Montana. She admits a fondness, no- a passion, for travel that was sparked by National Geographic magazine. Working as a Peace Corps volunteer in Ghana was a pivotal experience for her. She has always wanted to come to Antarctica, but not as a tourist. Experiencing the ice and being a part of the environment was the experience she craved. . Other world travelers she met, told her there were jobs available here, but that they were really hard to get. So she just put the information away. Later in Alaska, a person she worked with had worked at South Pole and shared her experience. Convinced by her friend, that she could "make it here" she applied and was accepted. This is her second season in Antarctica. In the first season, she worked at South Pole for the summer driving a truck loader. Some farm and landscaping experience helped her land that job. Now she works here at WAIS cooking delicious meals for cold, tired people. She finished high school and was quite interested in art. She relates that she really didn't like algebra in high school, but it was required. She said she argued all the time with the teacher that she shouldn't have to take it because she would never use it. She spent a lot of her time in that class decorating her algebra papers with doodles and artwork. She remembers the Algebra teacher giving her extra paper to do her art on, telling her she should continue doing art, but that algebra papers were not the right place for it. She thought that was very kind of him - to not take her art away, just help her find a place for it. Silver liked school and had friends in all the different subgroups that form in schools. This ability to bridge cliques may have been one of the important things that "prepared me for being on many continents and experiencing many cultures," she says. She went on to college, with a major in art, but found that college just wasn't for her at that time. She says, "I may still go back, though" She began working, got married, ran a landscaping and lawn care business with her husband, got divorced and worked on a farm for a while, traveling to different countries whenever possible. These types of work with tractors and other equipment were pivotal in allowing her to land the "truck loader" job at South Pole. She still tries to maintain her art interest on the ice. She made many of the decorations for the holidays that can be seen around camp and is currently painting a sign. She uses a lot of basic math in her work, especially fractions, ratios and proportions as well as conversions of measurements. One thing that she regrets not learning more of is typing. She is still a hunt-and-peck typist, but her job requires lots of paperwork. She says in high school she was allowed to get out of typing class to take another art class. "They should have stuck to their guns and made me learn typing!" she says emphatically. Another thing she wishes she had done was learn another language. "It's much harder when you are older or so it seems", she noted. When asked what she likes best about her Antarctic experience, she relates her delight in her Scott tent. "It's calm, you have to bend down to crawl into it. It's just magical-I'm sleeping right on the ice, right on the continent." She loves the clouds out here too. The hardest thing for her is that there is not enough time for personal time alone and just go for walks and think. Her job takes long hours and the community is very close-knit. There aren't many places to go to be alone. Her advice for students in high school and middle school is "Listen to your teachers, your mother and your grandparents. Try to learn from their experience by gathering stories from them. Really spend lots of time with your grandparents. And take all kinds of jobs - try different things out if they allow you to be in the environments you love or want to be part of."